The moment you step out of your vehicle, you'll experience the true "up north" feeling of relaxation, eagles, deer, wildlife galore! This magnificent custom log home is located in a gated, wooded and very private waterfront community among other high quality homes. This wonderful home offers many detailed master pieces like the hand carved wood entrance door; outdoor waterfalls, ponds, and gardens; a custom kitchen with granite counters, island and stainless appliances; tiger hardwood flooring; a soaring river rock floor to ceiling wood burning fireplace; main floor master suite with it's own private bath; 2 awesome lake view bedrooms on the upper level; lower level family room with a wood burning fireplace, bathroom and a 15' x 12' dog kennel! 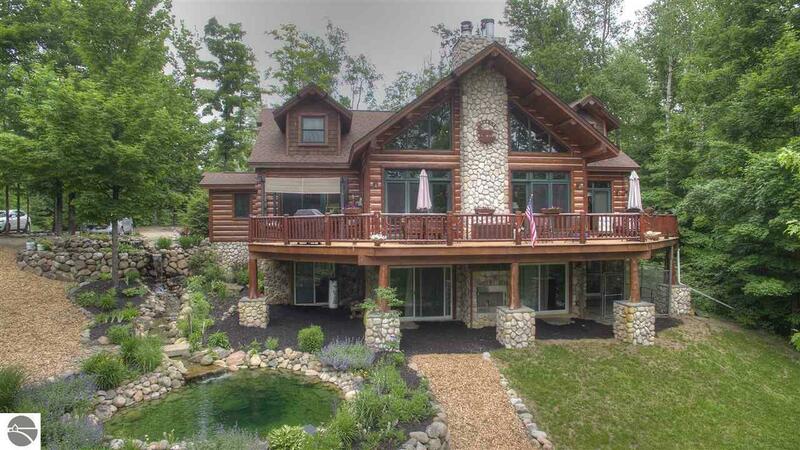 Enjoy your days on the beautiful DNR stocked, no wake, Green Lake or from your very own private dock. Top off your evening sitting next to the outdoor wood burning fireplace or the waterfront deck! Property legal description offers 220' of private frontage on Green Lake and 75' of private frontage on Lost Lake. Bedroom 1 Size: 18'7" x 13'2"
Din Rm Size: 14'3" x 13'6"
Fam Rm Size: 27' x 27'6"
Kit Size: 16'2" x 14'4"
Liv Rm Size: 19'5" x 26'1"
Other Size: 15' x 12'9"
Waterfront Details: Priv Frontage (Wtr Side), Inland Lake, Water View, Sandy Bottom, No Wake, Yes, 295 Ft.